The purpose of this chapter is to describe MuSA.RT Opus 2, an interactive system for tonal visualization of music at multiple scales, and to present examples of the types of musical features and attributes that can be abstracted and visualized by the system. MuSA.RT aims to create an environment by which musical performances can be mapped in real-time to a concrete and visual metaphor for tonal space, wherein we can see the establishment and evolution of the tonal context. In this environment, expert musicians will be able to see the tonal structures of what they play, initiated listeners will be able to visually follow the structures that they hear, and novices can learn to hear the structures that they see. MuSA.RT is both an interactive art installation that can convert musical performances into mathematically elegant graphics and a scientific tool for visualizing the inner workings of tonal induction and tracking algorithms. 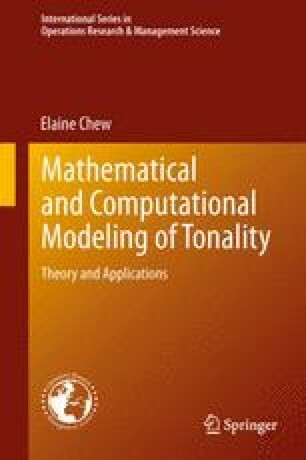 In this chapter we describe the mapping strategies for transforming a MIDI stream into tonal structures in 3D space, and our solution for overcoming the challenge of real-time concurrent processing of data streams; we will also give examples and present case studies of visual mappings of music by Pachelbel, Bach, and Barber. The reader can download the latest version of the MuSA.RT software, MuSA_RT, from the Mac App Store (https://itunes.apple.com/ca/app/musa-rt/id506866959?mt=12, cited 30 August 2013), follow the examples posted at https://musa-rt.blogspot.com, or try out new ones themselves. We thank Carol Krumhansl for her comments and suggestions that have helped improve the clarity of this chapter, and Craig Sapp for encoding the MIDI examples.